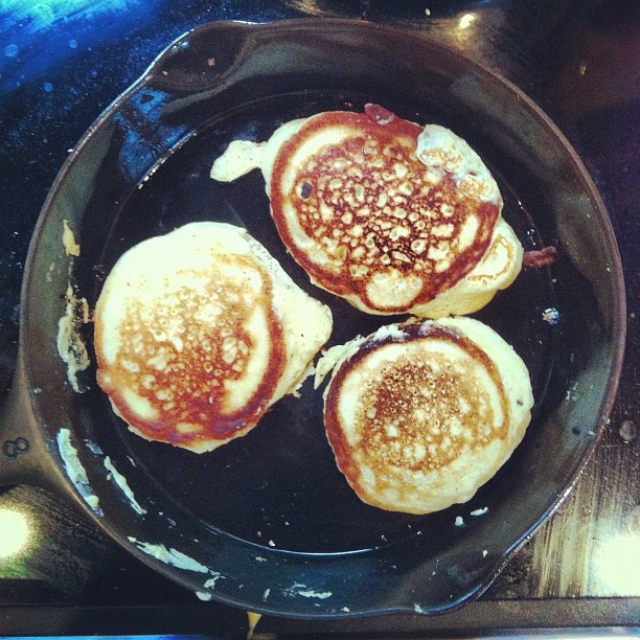 I first made these delicious pancakes in Upstate New York in a cabin on the side of a hill. It was such a rich and satisfying treat to go with my morning cup of coffee. Try these pancakes with fruit and yogurt, butter and maple syrup, or Nutella and Bananas! In a small bowl, combine Flour, Baking Powder and Baking Soda. In a larger bowl, mix together all of your other ingredients except for the water. Slowly start adding the wet ingredients to the dry ingredients and whisk together until there are no lumps. Use water to thin the batter as needed. The less you use, the thicker the pancake! The more you use, the flatter and more "crepe-like." Butter up a cast iron or non-stick skillet over medium heat. It's very important not to make the heat too high. Let the pancakes get crispy and brown on each side. This could take up to 4 or 5 minutes. Try to be patient and not poke or prod too much, it's worth it! These thick 'cakes rise and get super fluffy! Keep the finished pancakes covered to keep warm until you're ready to serve. Enjoy!